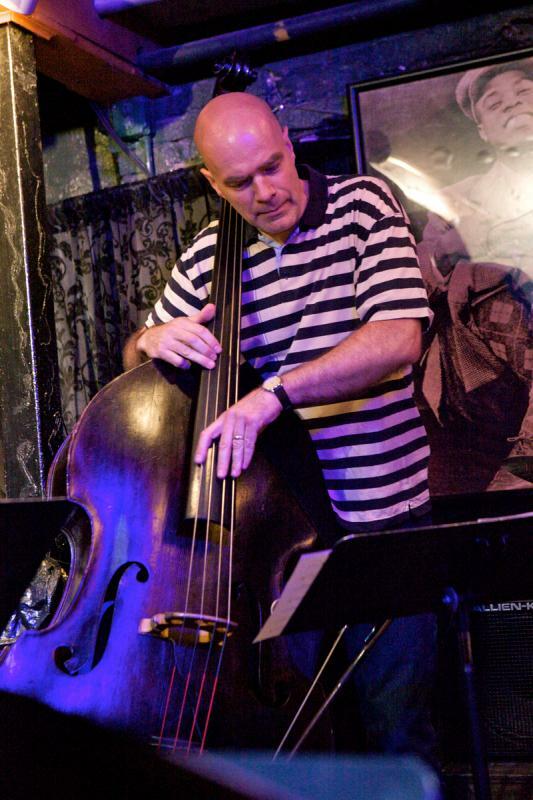 We wouldn't expect bassist/composer Joris Teepe to bring along a big band, symphony orchestra, and a chorus of a hundred voices with him to a gig at Small's Jazz Club. 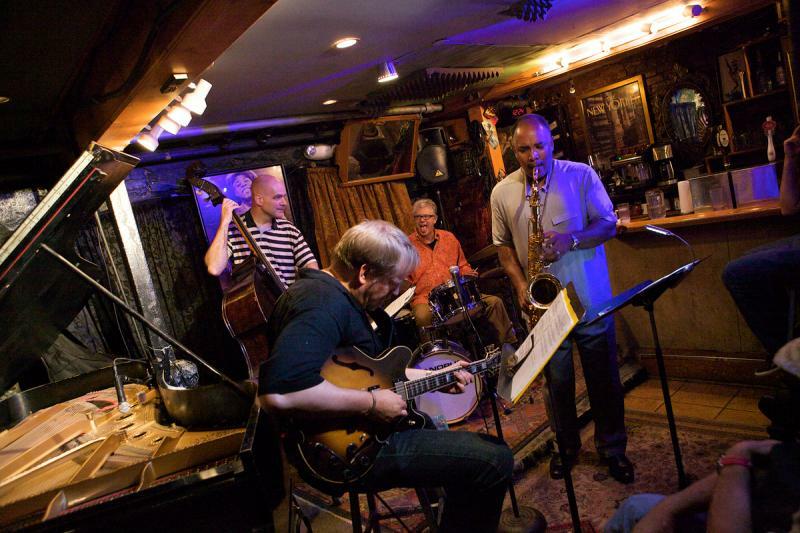 While there's no doubt that Small's is a prominent venue on the New York City jazz landscape, it's certainly not the largest. But this didn't deter Teepe from showcasing a selection from "Work, Work, Work," his ambitious composition written for the aforementioned aggregation about the abuses of slavery and child labor. 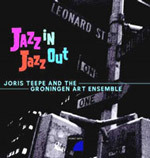 The piece premiered in March, 2012, conducted by John Clayton, in the Netherlands city of Groningen, where Teepe heads the jazz studies program at the Prince Claus Conservatoire. 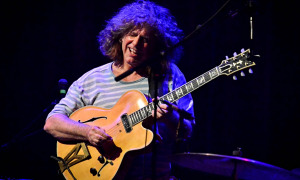 At Small's, Teepe brought his trio, featuring saxophonist Don Braden and drummer Matt Wilson, augmented by guitarist Dave Stryker. 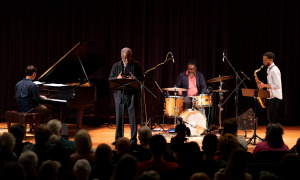 As arranged for this ensemble, "Work, Work, Work" featured tightly scored passages of contrapuntal lines and march-like sections, along with extended improvisations by each member. 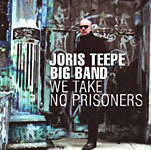 Teepe's especially strong solo here featured subtle and sensitive interplay with Wilson, the drummer focusing a good bit on his snare and employing a wide dynamic range. Braden's work on this piece and throughout the two sets particularly stood out, marked by his extraordinary imagination and brilliant execution, displaying influences of John Coltrane, Sonny Rollins, Wayne Shorter and other jazz masters, while presenting his own very personal voice, at times full of musical complexities, but soulful throughout. Teepe's own compositions predominated at the Small's show. The group opened with his "Candid Camera," featuring an adventurous Braden solo with climatic altissimo playing. 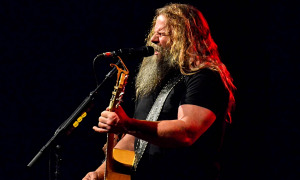 Wilson contributed some highly inventive and explosive work on the tune, and Stryker added distinctive chords and solo lines. 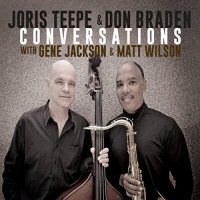 After "Work, Work, Work," the group played two compositions by Braden, a frequent collaborator with Teepe in many contexts dating to the 1990s, when the bassist first arrived in New York from the Netherlands. 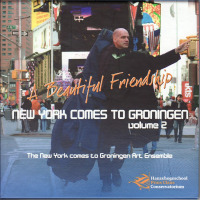 Their work together ranges from their co-led CD, Pay as You Earn (Mons, 1995), featuring trumpeter Tom Harrell and others, to Teepe's A Beautiful Friendship: New York Comes to Groningen, Volume 2 (Hanzehogeschool, 2012). For Braden's ballad at Small's, "Mysteriosa," he switched to alto flute, displaying an especially rich, deep tone, which was beautifully featured in a long, free cadenza at the end of his solo before returning to a concluding melody statement. Braden was back to tenor sax for "Three of a Kind," a composition in 3/4 time that appears on his first CD as a leader, The Time Is Now (Criss Cross, 1994). 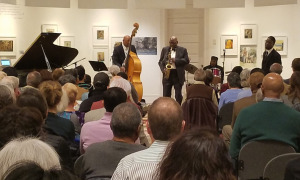 The group started off its second set with "Inventions in Maine," a Teepe composition that evoked both Thelonious Monk and Wayne Shorter and is featured on the bassist's Going Dutch (Twinz, 2004), a quintet date including Braden and trumpeter Randy Brecker. 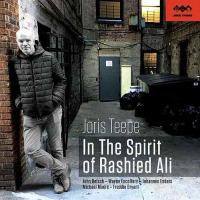 Teepe's "Raw Fish" was a special highlight of the set, a tune in 6/8 that appears on Judgement Day, Volume One (Survival, 2006), by Rashied Ali, the noted drummer with whom Teepe played for nearly decade. 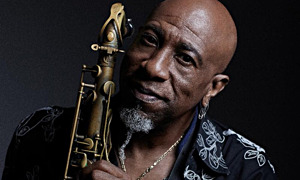 Here, Wilson was especially inventive in his solo, holding his sticks in unconventional ways, dropping them haphazardly on his drumheads, then picking them up and scraping them against the heads and cymbals. And, in tongue-in-cheek tributes to their own childhoods, Braden and Stryker wove into their solos some quotes and variations on "The Fishin' Hole," a tune best known as the theme from The Andy Griffith Show, whose star passed away earlier in the month. Charles Mingus's tribute to Lester Young, "Goodbye Porkpie Hat" was one of just two selections within the two sets that weren't original compositions by either Teepe or Braden. 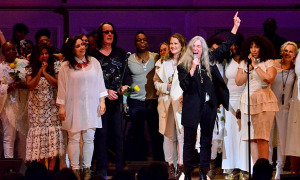 The group presented the tune in a unique arrangement, with an introduction by Stryker, followed by Teepe complementing Braden's statement of the melody by playing in parallel fourths. Kurt Weill and Ira Gershwin's "This Is New" was the closer, and featured Wilson trading fours with the rest of the group, which jelled closely together at the tune's conclusion in some spirited collective improvisation. Teepe's playing was especially exploratory and expressive here. He plucked his bass with both forefinger and thumb on his left hand, eyes closed, and atop his tall frame he pointed his chin upward in moments of joy.